Carlingswitch OFF/ON/(ON) double pole V series Contura rocker switch body. 4 terminal, double pole. The top two terminals (2 and 5) are power "in" and the bottom two are power "out". The bottom left terminal (3) is activated when switch is actuated to the "ON" position. Both bottom terminals (3 and 6) are activated when the switch is actuated to the (ON) momentary position. 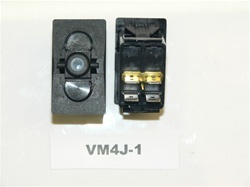 Typically terminal 3 feeds the ignition circuit/accessories/fuel pump relay and terminal 6 feeds the starter circuit/solenoid relay. Common for Marine, RV, automotive, and other 12V DC applications. Typically used as an ignition switch. Choose from a variety of actuators with different lenses. Actuator part numbers begin with VV. Electrical > Switches > Carling rocker switch bodies and Acc.